While PDF proposals are super old school, we believe that, in our paperless dream, you should plan for the worst and hope for the best, which, in this case, means always enabling the PDF versions of your proposals. Of course, that means you have to prep your PDF too. When deciding among the heavy competition for our design a great proposal contest, it actually came down to the impression left by the PDF. One of the most common mistakes is that folks forget to preview the PDF version before sending it. Of course, the web-based version is going to be different than the PDF, which is why we continue to make previsions so you can enhance the PDF version. The pages of your PDF will all squish together, unless you add Page Breaks. This is definitely logical to add at the end of each section, plus anywhere else you might like to see a page. But don’t add one at the end of the final section, lest you want to waste a blank page. On Step 4: Finalize, you will find a new Proposal Option: Table of Contents, which will convert the Block Titles and Sections from your web-based version into a Table of Contents with Page Numbers on Page 2 of your PDF version. While it’s automatically ticked OFF, if you turn Generate PDF version ON, then we’d recommend you turn Table of contents ON. If you want to preview what this looks like, click Save as Draft and then Download the PDF. 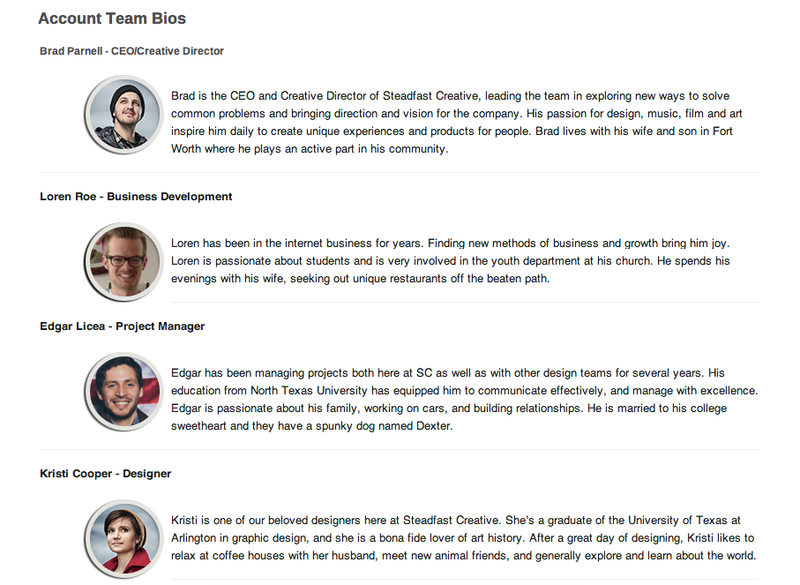 Introduce Your Team: With Smiling Faces! Photos and other Media Content increase your chances of acceptance by making your proposal more memorable. Like one of our RunnersUp, Steadfast Creative did in their winning proposal, you need to take the time to show off your staff, as friendly faces with applicable experience. You want your proposals to be personal and from you, and one way to do this is by having the business proposal come directly from you. By default, your proposals are sent from the email No-reply@quoteroller.com. To change that, go to Settings > Company. Scroll down and click Use original email address to send notifications to client. Hit Save. 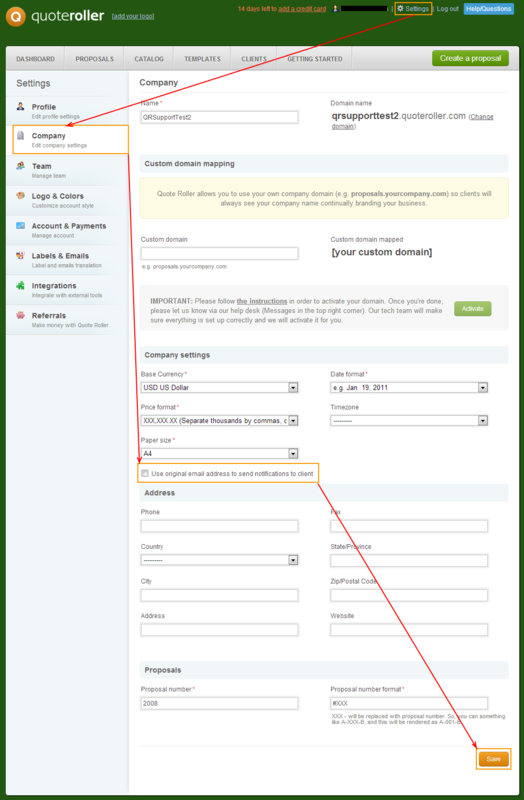 If you have multiple team members in your account, it will use the registered email address for each team member. 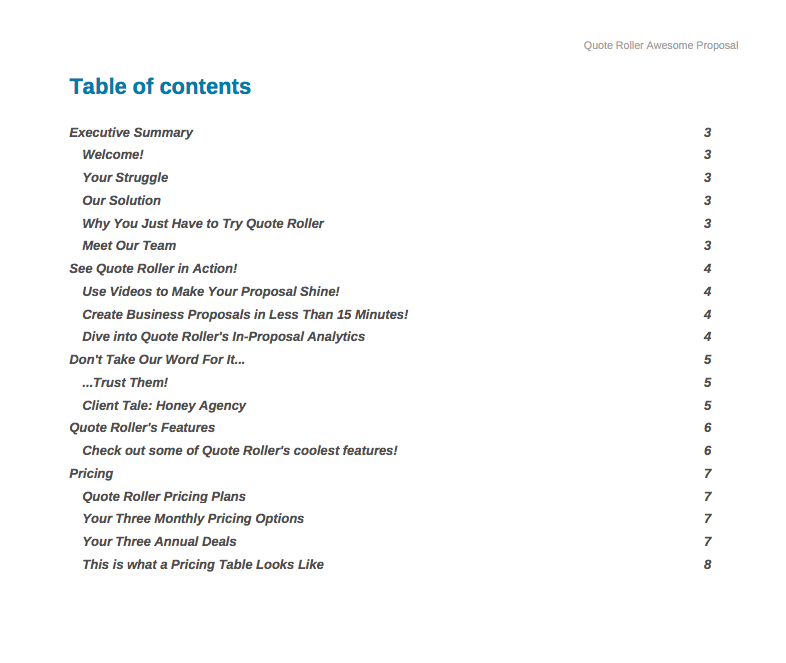 As you know, Quote Roller is all about making it easier for your prospects to accept your proposals. However, we find that people use the Web-only Gallery Block too often, forgetting they then won’t have images in the PDF version. (Notice a theme about forgetting about the PDF version?) Use a Text Block to upload smaller images and position them along with descriptive text. Much of the time, you don’t even need a the Gallery Block. You may want to customize what your prospects see inside the Quote Roller app and when they receive emails. This could be changing the language — we currently have it all set up for Spanish and Russian, but you are free to offer your translation services for other languages — or you can use it to customize the messaging, like changing the “Accept” button to say “Sign.” Note: when you change your Labels & Emails, you change it for each and every proposal. Go to Settings > Labels & Emails. 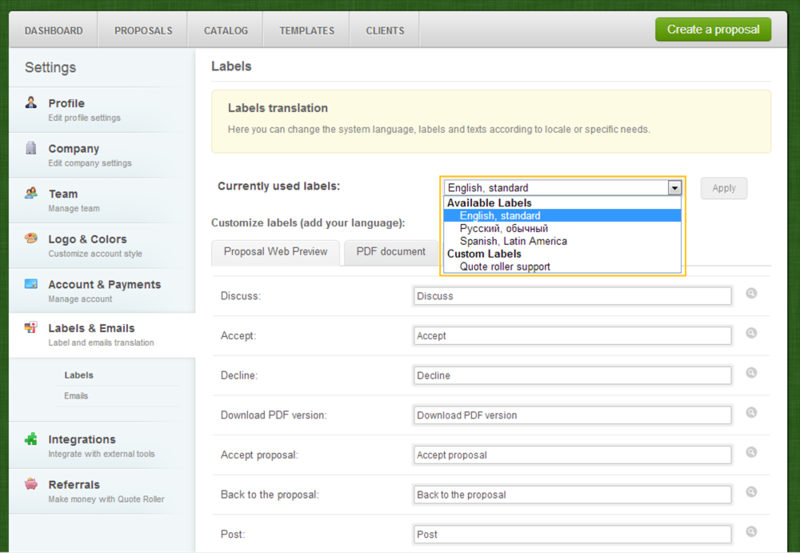 Here you can click on English, standard in the drop-down Currently used labels box to choose the new language and Apply. Or you can go ahead and change any of the individual labels, always hitting Save labels. Again, this will now change what your clients see when viewing any proposal. 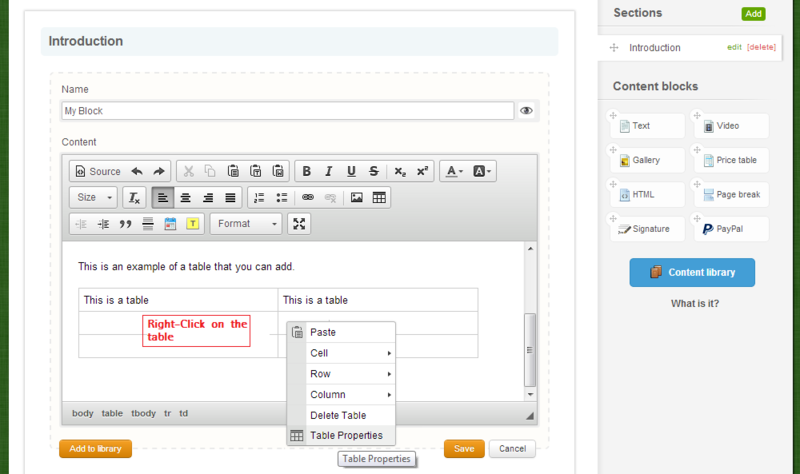 You can create or copy-paste an existing table into a Text Box. 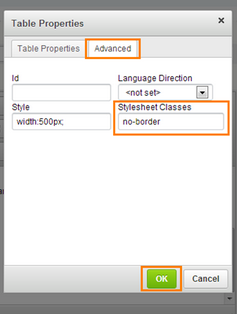 Right-click on the table > Table Properties. Write “no-border” and click OK. Voila! Border has disappeared, but all your ducks are still in neat little rows.